The tour of the ISO 9001:2008-certified plant was sponsored by Roberts AIPMC, a leading name in the manufacture of radiators (Evercool), leaf springs (Tiger), mufflers and exhaust systems (Soundex) in the country. 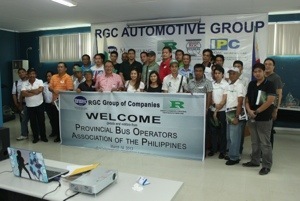 The company, a part of the RGC Group of Companies, makers of the popular Uratex foam, also provides metal stamping and fabrication services to some of the world’s popular Original Equipment Manufacturers (OEMs) like Mitsubishi Motors Philippines, Isuzu Philippines, Columbian Motors, Pilipinas Hino and Suzuki. The Roberts Automotive and Industrial Parts Manufacturing Corporation plant and office is located at the RGC Compound, Canlubang Industrial Estate, Bo. Pittland, Cabuyao, Laguna. For more information, visit www.roberts.com.ph.